Everyone likes a tote bag for carrying library books, taking things for your baby, going to garage sales, or giving as a gift. 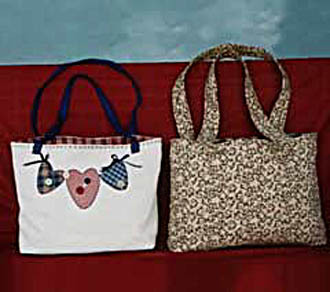 This pattern has three different sizes of tote bags. Quilt your own fabric or buy pre-quilted fabric and have fun designing your own bag. Yo-yo and heart patterns are included. Price includes shipping and handling.